Researchers have identified a previously unknown feature of human anatomy with implications for the function of all organs, most tissues, and the mechanisms of most major diseases. Published March 27 in Scientific Reports, a new study co-led by an NYU School of Medicine pathologist reveals that layers of the body long thought to be dense, connective tissues—below the skin’s surface, lining the digestive tract, lungs, and urinary systems, and surrounding arteries, veins, and the fascia between muscles—are instead interconnected, fluid-filled compartments. This series of spaces, supported by a meshwork of strong (collagen) and flexible (elastin) connective tissue proteins, may act like shock absorbers that keep tissues from tearing as organs, muscles, and vessels squeeze, pump, and pulse as part of daily function. 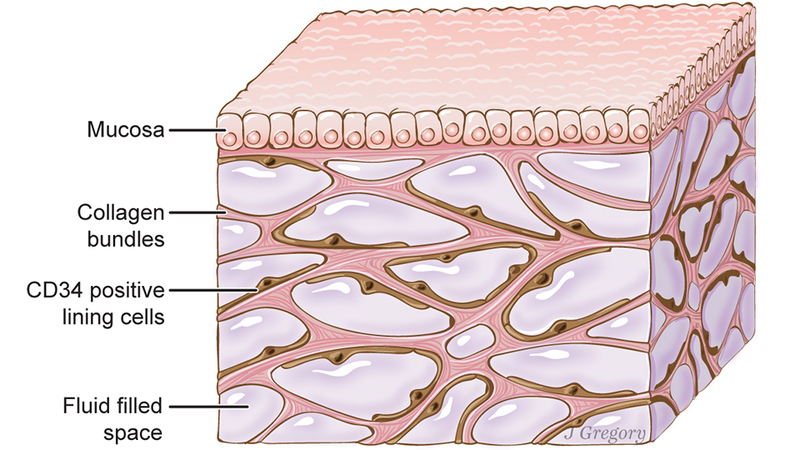 A newfound organ, the interstitium, is seen here beneath the top layer of skin, but is also in tissue layers lining the gut, lungs, and urinary systems, as well as those surrounding blood vessels and the fascia between muscles. The organ is a body-wide network of interconnected, fluid-filled compartments supported by a meshwork of strong, flexible proteins. Illustration by Jill Gregory. Printed with permission from Mount Sinai Health System, licensed under CC-BY-ND. Importantly, the finding that this layer is a highway of moving fluid may explain why cancer that invades it becomes much more likely to spread. Draining into the lymphatic system, the newfound network is the source of lymph, the fluid vital to the functioning of immune cells that generate inflammation. Furthermore, the cells that reside in the space, and collagen bundles they line, change with age, and may contribute to the wrinkling of skin, the stiffening of limbs, and the progression of fibrotic, sclerotic, and inflammatory diseases. The field has long known that more than half the fluid in the body resides within cells, and about a seventh inside the heart, blood vessels, lymph nodes, and lymph vessels. The remaining fluid is “interstitial,” and the current study is the first to define the interstitium as an organ in its own right, and as one of the largest of the body, say the authors. The researchers say that no one saw these spaces before because of the medical field’s dependence on the examination of fixed tissue on microscope slides, believed to offer the most accurate view of biological reality. Scientists prepare tissue this examination by treating it with chemicals, slicing it thinly, and dying it to highlight key features. The “fixing” process makes vivid details of cells and structures, but drains away any fluid. The current research team found that the removal of fluid as slides are made causes the connective protein meshwork surrounding once fluid-filled compartments to pancake, like the floors of a collapsed building. The study findings are based on newer technology called probe-based confocal laser endomicroscopy, which combines the slender camera-toting probe traditionally snaked down the throat to view the insides of organs, called an endoscope, with a laser that lights up tissues, and sensors that analyze the reflected fluorescent patterns. It offers a microscopic view of living tissues instead of fixed ones. Using this technology in the fall of 2015 at Mount Sinai Beth Israel, endoscopists and study co-authors David Carr-Locke, MD, and Petros Benias, MD, saw something strange while probing a patient’s bile duct for cancer spread. It was a series of interconnected cavities in this submucosal tissue level that not match any known anatomy. Faced with a mystery, the endoscopists walked the images into the office of their partnering pathologist, Dr. Theise. Strangely, when Dr. Theise made biopsy slides out of the same tissue, the reticular pattern found by endomicroscopy disappeared. The team would later confirm that very thin spaces seen in biopsy slides, traditionally dismissed as tears in the tissue, were instead the remnants of collapsed, previously fluid-filled compartments. For the current study, the team collected tissue specimens of bile ducts during 12 cancer surgeries that were removing the pancreas and the bile duct. Minutes prior to clamping off blood flow to the target tissue, patients underwent confocal microscopy for live tissue imaging. Once the team recognized this new space in images of bile ducts, they quickly recognized it throughout the body, wherever tissues moved or were compressed by force. The cells lining the space are also unusual, perhaps responsible for creating and maintaining the supporting collagen bundles around, say the authors. The cells may also be mesenchymal stem cells, says Dr. Theise, which are known to be capable of contributing to the formation of scar tissue seen in inflammatory diseases. Lastly, the protein bundles seen in the space are likely to generate electrical current as they bend with the movements of organs and muscles around them, and may play a role in techniques like acupuncture, he says. The other first study author was Rebecca Wells of the Perelman School of Medicine at the University of Pennsylvania, who determined that the mesh in the newfound sinus was comprised of collagen and elastin bundles. Also, study authors were Jason Reidy of the Electron Microscopy Lab within the Department of Pathology at NYU School of Medicine; Heather Klavan, Markus Miranda, Darren Buonocore, Susan Kornacki, and Michael Wayne of Mount Sinai Beth Israel; and Bridget Sackey-Aboagye from the University of Pennsylvania. Dr. Carr-Locke is currently clinical director for the Center for Advanced Digestive Care at New York-Presbyterian and Weill Cornell Medicine. Dr. Benias is an assistant professor at the Donald and Barbara Zucker School of Medicine at Hofstra/Northwell Health. This work was funded in part by a grant from the National Institutes of Health (DK081523).